Dax and Zoe are twins. They go together like peanut butter and jelly. It’s the night before the twins are starting kindergarten, and they have the just-about-to-start-school jitters. After all, they will be in different classrooms! What will kindergarten be like when they’re not together all day? But Dax and Zoe will learn that kindergarten is full of new surprises and adventures, and being apart for a short while isn’t so bad. Named one of the best books to help kids get ready for a new school year by Brightly.com, which commented: "Read along to see how these two siblings find the silver lining and the fun in being apart." 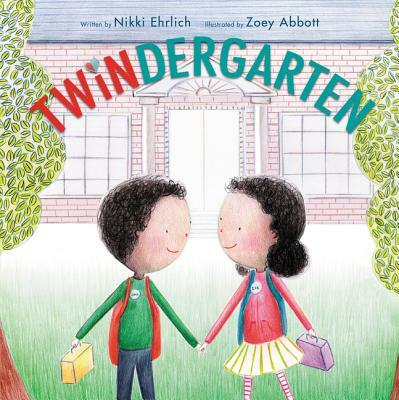 From author Nikki Ehrlich and artist Zoey Abbott Wagner comes a heartwarming picture book that’s perfect for anyone dealing with new experiences, especially little ones getting ready for school. Nikki Ehrlich was a preschool teacher before she had her twin boys and their baby brother. She loved working with her students and hopes to return to the classroom when her kids are a little older. She remembers her own twins' first day of kindergarten and hopes her book Twindergarten will help twins and all kids feel confident and excited that kindergarten will be great! Nikki lives in New York City with her husband, three kids, and two dogs. Zoey Wagner lives in Portland, Oregon, with her husband, two kids, and a big dog named Carrots. She loves telling stories and making things with her hands. Her favorite food is ice-cream sandwiches (plural). Twindergarten is her first book. You can visit her online at www.zoeyink.com.